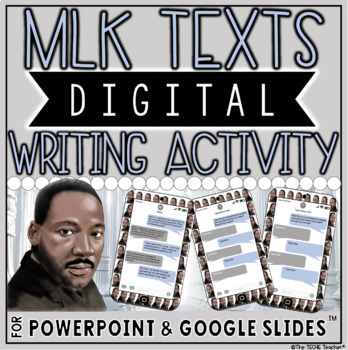 Students can get creative and show their knowledge of Martin Luther King Jr's contributions with this digital writing activity that comes in Google Slides™ and PowerPoint. 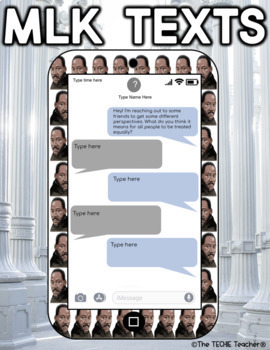 Directions: Students pretend that the cell phone belongs to MLK (and that he is still alive) as they type a texting conversation between MLK and any person/character of their choice. They will have to plan out their conversation carefully in order to fit everything in the provided bubbles. 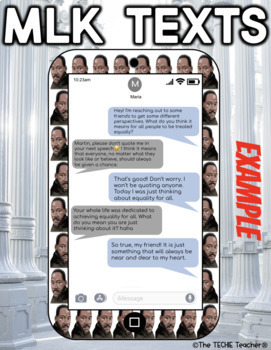 Two different templates are provided: 5 texting bubbles vs. 6 texting bubbles. I have already typed the text in the first bubble to serve as the writing prompt but this can be deleted or edited to fit your needs. 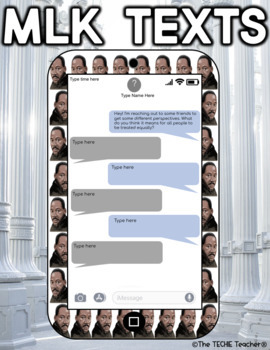 An example of a completed texting conversation is included.